Tesoro is an ambitious work, devoted to "all of alchemy," containing numerous hand-drawn ink and watercolor illustrations; some of the pictures are allegorical, many others document practitioners working with equipment. Only passing reference is made in this manuscript to Neri's later claim to fame: glass—its most notable appearance in Tesoro is in illustrations of experimental vessels. 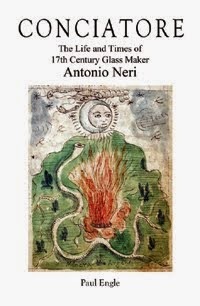 1598 was two or three years before Antonio's glassmaking career is thought to have started. His life was busy on other fronts. He had just been ordained as a Catholic Priest, undergoing the laying on of hands ceremony, probably by his neighbor on Borgo Pinti, the Florentine archbishop Alessandro Ottaviano de' Medici. 1598 was also a year of tragedy for the Neri family; by the summer, his father Neri Neri, personal physician to the grand duke, died of an unknown illness, but not before making arrangements for his family, which included a will. A court magistrate would oversee the now orphaned children's education, inheritance and dowries. They would soon suffer further tragedy in the unexpected death of a brother; sixteen year-old Emilio would leave them on Christmas day of the following year, in Castello outside Florence. Of the four illustrations, "Preparing Animals" focuses on activity within a kitchen. (See above, click to enlarge). The scene is intriguing in that it appears to take place in a domestic setting. Labels call out the four Aristotelian elements; birds hanging from the rafters represent air, fish on a grilling rack represent water, a whole carcass on the spit represents earth and fire appears as itself. The scene suggest that this setting is none other than the Neri family kitchen and that the practitioners of the art are three of Antonio's siblings. In the middle right, a young boy is engaged in turning the spit (in green). The best candidate would be then eleven year-old Allesandro, the eventual heir to the family, whose own son named Neri would carry on the family practice as a physician. Of the two young women pictured, the three family choices are fourteen year-old Lucretia, Sixteen year-old Maria and twenty-six year-old Lessandra. 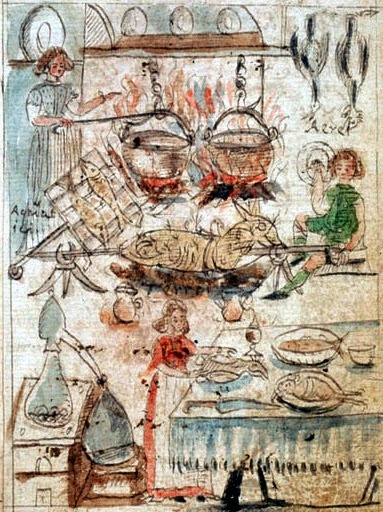 In one sense, the methodology of alchemy lives-on today in kitchens around the world. The process of combining raw ingredients and cooking them together, of experimentation and of iteratively refining a recipe to perfection, this is not so different from what Antonio Neri and his siblings were doing four hundred years ago.